There are parts of the country where local authorities are looking at reducing the number of road signs in the interest of road safety. The argument is that there is so much information that it becomes a distraction and therefore more of a danger and a hindrance to safe progress on the highway. And we should be careful to protect those who work on the highways - no-one would argue against that. A recent accident involving a Cormac worker on the A390 should be reminder enough that this is a serious business. But…. The 'No Money' Council has just spent £172k on massive new digital traffic signs in Truro. Are they really necessary? And are they really effective? The recent chaos on the A390 reduced traffic to a standstill and everyone had plenty of times to read all the signs but at normal road speeds are there just too many for normal beings to take in? With no consultation or planning (or did I miss that?) 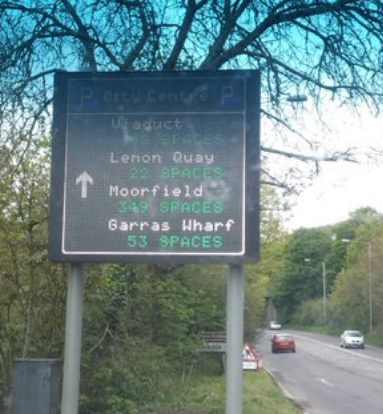 Cormac have installed £172,000 worth of flashing signs. To what purpose? If there is a log jam we don't have many options for alternative routes. If you are local you know what car parks will likely have space. If you are not local, you have no idea where these car parks are and no time to read the sign as you go by. Next thing, the Council will employ a communications expert to write messages for them and monitor feedback. Of course, the new employee would need to do graphics as the signs have that feature too. At least we won't be able to dismiss with “scant regard” the Council's “achievements” because they will flash these signs at us wherever we are. Why not ask people to tune into Radio Cornwall and get a proper message?